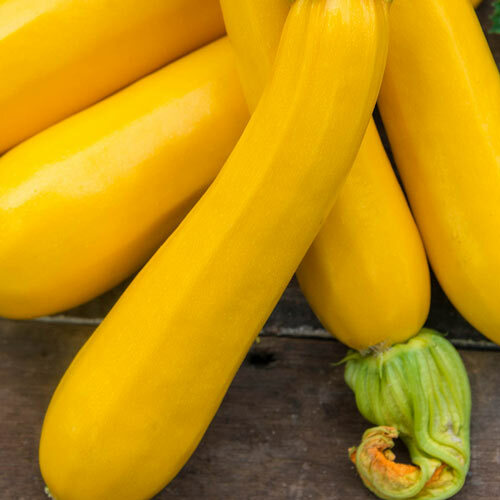 A taste-test winner in our summer squash trials, Max &apos;s Gold Hybrid Summer Squash yields plenty of vibrant, deep golden yellow, shiny fruits with a rich, savory flavor and a small seed cavity. Plants generally grow 36 in. tall and wide with an open habit and low spines. Max &apos;s Gold plants remained healthier later in the growing season than other summer squash varieties. Unlike winter squash, summer squash is harvested when the fruits are immature and have thin skins. We like to harvest them at 6-8 inches. Summer squash seeds can be sown when the weather is warm and all danger of frost has passed. Plant again in midsummer for a fall crop. 55 DAYS. Spacing2 plants per hill, spacing hills 4 feet apart. FoliageTypical summer squash foliage, green with silver mottled leaves. FruitVibrant deep, golden yellow fruit with a small seed cavity and rich, savory flavor. Seed CountApprox. 25 seeds per packet. CommentsVibrant, deep golden yellow, shiny fruits consistently produced fruit of high eating quality in our trials! Enjoy even more of its rich, savory flavor, due to its small seed cavity. We like to harvest them at 6-8 inches, but even larger sizes retained a good interior quality with minimal seed development. In our trials, this variety remained healthier than other varieties later into the growing season. Plants generally grew 36 inches tall and wide, with an open habit and low spines.